As this season of archaeology is finished, there aren’t a lot of updates from the field to create interest and traffic. Happily I have a large archive of old photographs of Doha to look through and post. There just aren’t a lot of resources for this sort of thing online, and most old photos of the Gulf are in private/personal collections. I love being able to share these photos, especially as many residents are completely unaware that there were older buildings before the shiny towers and large developments came to Doha. I think a lot of these photos resonate with people as they depict familiar places (like the Corniche) before a lot of the prominent development. 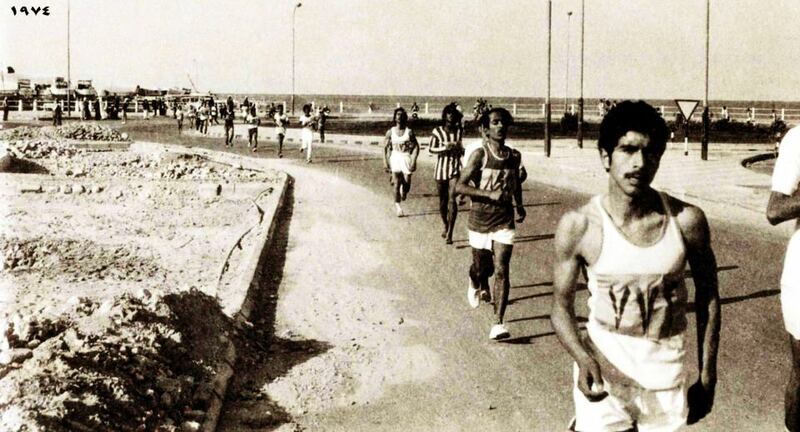 Race on the Corniche in Doha, 1974. It’s @Mozishaq’s aunt. Taken from iconic “Arab” to auntie on Instagram. Though we already feel oversaturated by social media, it still has the ability to surprise, delight, and de-center. We love your post! We are a newly established e-commerce site that caters to handmade items mainly from the Middle Eastern, North African region. We have recently ventured into the Uk handmade market to join our establishment. We understand that you are an online blogger and would like to know if you would be interested in writing an article about us. Founded in 2011, Ananasa.com is an online marketplace that enables artisans, artists and designers in the Middle East to sell their creations worldwide with no barriers. Ananasa.com started when two sisters wanted to expose the hidden beauty of the Middle East to the world. Ananasa takes away the headaches of logistics, customer service & marketing so artisans can focus on creating their handmade items and individuals worldwide can buy unique items from the Middle East easily. A: adding an a at the end allows the word to become feminine, just like the co-founders.